Yesterday I was speaking with a friend about how Psalm 73 always pops up when I am troubled about how to live in the world and not be of it. As Paul tells the Corinthians (2 Corinthians 10:3): For though we live in the world, we do not wage war as the world does. In Psalm 73, The Trial of the Just, the psalmist expresses what happens to our thinking when we come close to losing faith that God is goodness and mercy and justice. In today’s Noontime reading we find a kind of companion psalm, a prayer of innocence, a statement of faith and an affirmation of our covenant promise with God. Just a few days ago we examined the first book of Esther in which the story of Mordecai begins to unfold. He is wrongly accused and knows that he must rely on God and no other for salvation. Like Job in his conversations with his three friends Bildad, Eliphaz and Elihu, he knows that only in a conversation with God will he find the answers he seeks. And like Susana in the Book of Daniel he also knows that always our help arrives in God’s time and way rather than our own. When we find ourselves in a quagmire not of our making, we might pray this psalm . . . I have walked without blame. In the Lord I have trusted. When we find ourselves in a nest of confusing lies and deceptions, we might pray this psalm . . . I do not sit with deceivers, nor with hypocrites do I mingle. When we find ourselves embroiled in a plot we did not devise, we might pray this psalm . . . I hate the company of evildoers; with the wicked I do not sit. And when we find ourselves rescued by God – as we always are – we might pray this psalm . . . My foot stands on level ground; in assemblies I will bless the Lord. Once someone said to me that Psalm 26 cannot rightly be prayed by anyone except Christ since none of us is as perfect as the person who speaks here. I replied that God does not expect perfection in our actions, only persistence in our attempt to be loving and just; that Christ is a tender brother who models how we might live yet forgives all our faults; that the Holy Spirit abides in each of us urging us to keep ever close to God. When we listen to the words Christ speaks to us as God manifested among us, we know that forgiveness and openness to renewal are important in our development. We know that the perfection God asks is our persistence in following Christ through any and all obstacles in our lives. We know that the first step we must take toward God is a genuine repentance for any way we have offended God. We know that God is eager to forgive our transgressions. And we know that we are given infinite opportunities to amend and renew ourselves. So today we take up this psalm to examine it and ourselves. Are there times when we are not completely innocent of wrongdoing? Yes, often. Are there times when we have been wrongly accused and maligned. Yes, and these times may be numerous. Does God always forgive, is God always present, and does God consistently welcome us home when we have given offense? Yes, and yes, and yes. Today, if we find ourselves wanting, we have the opportunity to turn back to our journey of persistence, for in this we find perfection. And also today, if we discover that we have been unjustly accused, we have the opportunity to petition God with all the other innocents who suffer at the hands of those who disdain patience and kindness and justice. Too often the innocent messenger is blamed for the harsh but true and necessary message. We may have been the receiver of such a communication and behaved badly . . . and we may also have been the deliverer and suffered through no cause of our own. In either case, let us together begin our singing . . . My foot stands on level ground; in assemblies I will bless the Lord. A re-post from October 30, 2011. Today we hear a portion of Esther’s story that resonates with humans in every age. Mordecai puts on sackcloth and ashes as he mourns an impending holocaust. He warns Esther that her future is in danger whether she takes action or not. He reminds her that her thinking that there is safety for her in the palace is a false one. And he suggests that perhaps she is queen for precisely this moment in history. His words force her into action once she realizes that inertia only invites evil. Apathy or disinterest are no protection against malicious intent. Do not think that in the king’s palace you will escape any more than all the other Jews. For if you keep silence at such a time as this, relief and deliverance will rise for the Jews from another quarter, but you and your father’s family will perish. Who knows? Perhaps you have come to royal dignity for just such a time as this. On this Ash Wednesday, as we wear ashen crosses on our foreheads at the beginning of the season of Lent, we explore our own role in human history; we examine our own fears and hopes. We pause in our journey through Esther to reflect on words from the 20th Century. From the Holocaust Encyclopedia site: “Martin Niemöller (1892–1984) was a prominent Protestant pastor who emerged as an outspoken public foe of Adolf Hitler and spent the last seven years of Nazi rule in concentration camps”. Both Mordecai and Niemöller invite us to examine our hearts. Esther invites us to consider our response to God’s call. Who celebrates Ash Wednesday? Click on the image of the woman and child receiving ashes to learn more. A Favorite from October 6, 2007. To read the epilogue (Esther F) consult the New American Bible (NABRE) using the scripture link above. We have examined the following motifs: understanding that the innocent suffer, knowing that much is expected of those who have much, accepting that silence is assent, learning to trust our covenant with God, cautioning against weaving webs of deceit (for ultimately the victim of this web is always the weaver), allowing nothing to step between us and God, repenting and being doers of the Word. This story is replete with solid ideas that are necessary if we are to approach and then pass through our Narrow Gate. It always brings me joy to read these verses because the over-arching idea of this story is the following: God will rescue his people, those who attempt to walk in The Way. This rescue may not be as visible or as obvious as we would like, but it is always and constantly available to us . . . because God is incapable of any lesser action. God will always console, God will always abide, God will always preserve, heal and protect. God will always restore. God will always be union and joy. When we explore Esther’s story, we discover God’s gift of goodness; we encounter God’s desire to rejoice in us; and we find every reason to proclaim our thanksgiving. This week we have looked at the many ways in which Jesus wants to heal us. We have seen him give sight to those who are blind, hearing to those who are deaf, and movement to those who are paralyzed. All he asks in return is that we use the gifts he freely gives us to bear fruit for the kingdom. Today we look at a Favorite adapted from a reflection written on October 26, 2009. In today’s reading we come across a story that is troubling for some: the sudden way in which Jesus withers a fig tree that has not produced fruit. Here Jesus has just entered Jerusalem and has cleansed the temple of the money changers. In the next portion of this story we will see Jesus’ authority questioned and we will sit at the Master’s feet to listen to a series of parables. Footnotes tell us that we might see Jesus’ actions here as ill-tempered and arbitrary, but it is really a prophetic act portending the judgment that is to come upon Israel “that with all its apparent piety lacks the fruit of good deeds and will soon bear the punishment of its fruitlessness”. (Senior 45) Here too, besides this obvious portending of the future, Jesus affirms the amazing power of faith – that if we believe we too might cause trees to wither and mountains to be lifted up. What we read is a strange dichotomy that causes us to think . . . a tool which any good teacher will use: The placement of a puzzle before students so that they might be called to think outside of the normal typical story. What is Jesus doing when he withers the tree? We might pose the theory that Jesus would win more converts if he had caused the tree to flourish; but then we miss the importance of our own free will. We, like the fig tree, have been planted in our particular place. We, like the fig tree, may have to exert ourselves to bear fruit. We, like the fig tree, will be held to an accounting of our stewardship of the gifts we have been given. 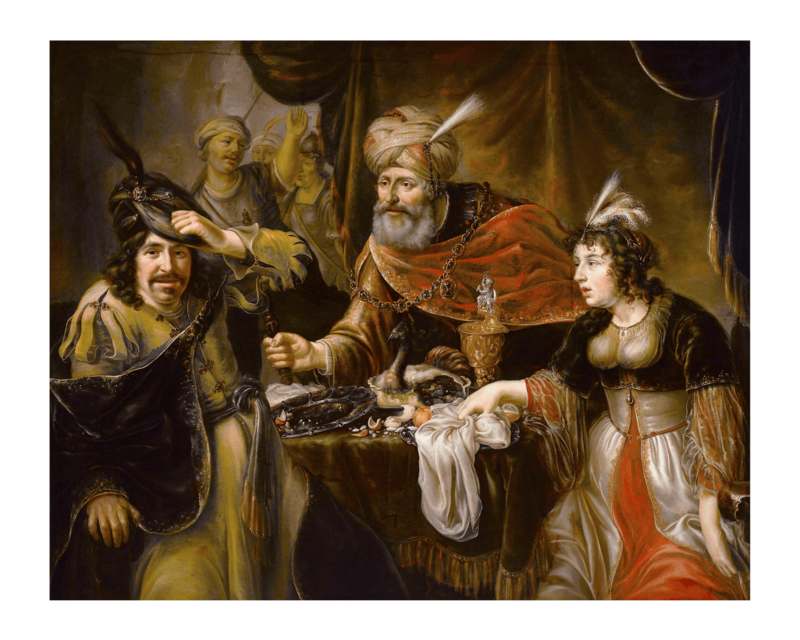 In one of our favorite stories, Queen Esther shrinks from the work she sees lying before her because she fears the loss of her own life and the lives of her fellow Jewish exiles. When she balks, her uncle Mordecai reminds her: Even if you now remain silent, relief and deliverance will some to the Jews from another source; but you and your father’s house will perish. Who knows but it was for a time like this you obtained the royal dignity? (Esther 4:14) Who knows for which moment in time our gifts are meant? Who are we to parcel them out in a miserly fashion or to decide to keep these gifts safely tucked away for ourselves? In Luke 12:48 at the close of the parable about the watchful servant, we hear Jesus remind us that much will be demanded of those who have been given much. We might think of this today as we move through our many small and big chores. What is it we have been given that we are asked to share? What can we do to be certain to produce fruit with the gifts we are given? And do we ourselves have the faith to wither trees and move mountains? Senior, Donald, ed. THE CATHOLIC STUDY BIBLE. New York, Oxford University Press, 1990.45. Print. We have visited the story of Esther frequently in our Noontime journey and this Christmas as pause to spend some time in Chapter 3. Because of various redactions, different Bibles have divided this story with both numbered and lettered parts but today we are looking at both Chapter 3 and B, the story about the letter of King Ahasuerus that decrees death to the Jewish people on the fourteenth day of the month of Adar. When we read the entire account, we know how the king finds out that Queen Esther is Jewish. 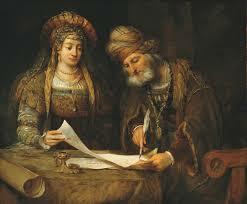 We know how Esther and her uncle Mordecai intercede with God and king for the preservation of the Jewish people. And we know what becomes of the envious Haman and his family. This may be an unusual story to consider on Christmas Day, but when we pause we see a connection with the Christmas Story: signs of God’s grace coming to a nation through people who are easily overlooked in a world that focuses on the supremacy and authority of powerful men. Today’s stories are about the surprising influence of the most vulnerable among us: a baby, and a woman. While we are not in any way suggesting that Esther is the equivalent of the Christ child, we may want to consider the parallel these stories offer as analogous to our own feelings of defenselessness. And we may want to take direction from both Esther and Jesus as we watch them obey the Father who created them. These stories show us that the human life is best lived in search of and in preparation for our divinity. They show us that fidelity, simplicity, honesty and courage are essential to one who seeks to arrive at the potential God breathed into each of us at our creation. Spend time with Esther 3 (B) today and consider it as preamble to a new coming. Tomorrow, God’s sign is simplicity.